Even though most of the Earth’s surface is covered with water, most of it is not directly usable for human consumption or applications. As the population increases and our general style of living standards increase, the importance useable water is becoming acute. 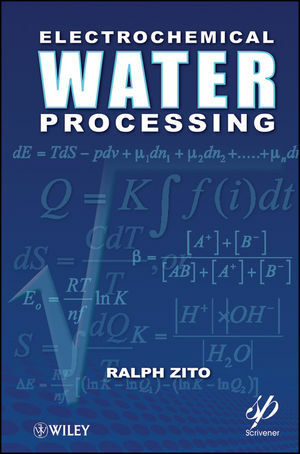 This book addresses this issue with approaches to treating water sources that require removal of unwanted or dissolved substances. In particular, it covers various methods for removing dissolved ionic materials. There are numerous methods for accomplishing this end, and the book reviews most of them in some depth. Ralph Zito, PhD, has been working in the field of electrical energy for over 30 years. With more than 40 patents and 60 papers to his credit, his resume is a virtual who's who of energy companies, such as GE, Westinghouse, and Sylvania, to name a few. He has taught at the Carnegie Institute, where he obtained his doctorate, and done research at New York University, where he received his baccalaureate. 1. Water Contaminants and Their Removal. 1.2 Technology, History, and Background. 1.3 Application Areas: Electrochemical Technology Water Processing. 2. Basic Electrochemical and Physical Principles. 2.2 Acidity and Alkalinity, pH. 2.3 Activity and Activity Coefficients. 2.4 Equilibrium and Dissociation Constants. 2.5 Electrode, or Half Cell Potential. 2.9 Free Energy and Equilibrium. 2.11 Ionic Conductance and Mobility. 3. Systems Description: General Outlines of Basic Approaches. 3.2 pH Control: Analytic Development. 3.4 Ion Exchange Resin Regeneration System. 4. Mathematical Analysis & Modeling Electrodialysis Systems. 4.1 Electrodialysis: Descriptions and Definitions. 4.2 Basic Assumptions and Operating Parameters. 4.3 Parametric Analysis: Flow-Through Configuration. 4.5 Batch Process Analysis: Re-Circulating or Static Water Processing System. 4.6 Design Exercises for Water Re-Circulation Systems. 4.7 Cell Potential and Membrane Resistance Contributions. 4.8 Diffusion Losses of Ions and Molecules Across Membranes. 5. System Design Exercises & Examples. 5.1 Electrolytic Generation of Bromine and Chlorine: Design Procedures. 5.2 Simple Estimate of Capital Equipment and Operating Cost of Electrochemical Desalination Apparatus. 5.3 Cost Estimates Outline for an Electrodialysis De-ionizing System. 6.3 Electrical Water Processor Portable Design. Appendix A: Some Physical Constants and Conversion Factors. Appendix B: Conductance and Solubility. Appendix C: Feeder Tube and Common Manifolding Losses. Appendix D: Variable Current Density. Appendix E: Mathematical Analysis: Water pH Control Cell and Ion Exchange Resin Regeneration. Appendix F: Industrial Chlorination and Bromination Equipment Cost Estimates. Appendix G: Design Mathematics in Computer Format. Appendix H: Mathematics for Simple Electrochemical Biociding.